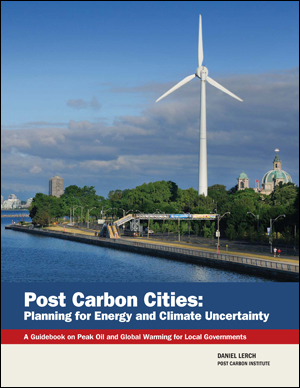 Post Carbon Cities: Planning for Energy and Climate Uncertainty (2007) was the first major guidebook on peak oil and global warming for people who work with and for local governments in the United States and Canada. It provided a sober look at how these phenomena are quickly creating new uncertainties and vulnerabilities for cities of all sizes, reviewed how “early-actor” cities started responding to peak oil, and recommended steps for local decisionmakers to take for addressing these unprecedented challenges. “When we are approached by cities interested in taking the next step to address climate and energy challenges, we encourage them to take advantage of the resources that Post Carbon Cities has to offer. The Post Carbon Cities program fills a unique niche in that it focuses on both peak oil and climate change issues, and offers practical direction for those communities that want to take action.